Discover the evolution of food. 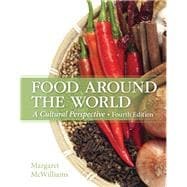 Food Around the World: A Cultural Perspective, 4e is a unique and fascinating text examining the geography, history, economic, religious, and cultural factors influencing food consumption and availability. Appropriate for all students, especially those in food science, dietetics, and nutrition, it examines cultural food patterns and fosters an appreciation for various regions, nations, and cuisines. Chapters explore how and why different regions developed their unique cuisines and include recipes from each region. Vivid maps and photographs bring global cultures and foods to life as students travel through each chapter. Extensive learning tools help students master material and make the text an instructor-friendly resource. Cultural insight through food: Chapters use food as an engaging avenue of insight into cultures around the world. Well-rounded understanding: Detailed chapters present topics with proper context and include effective learning tools. Opportunities to experience global cuisine: Students can create dishes from around the world, bringing topics from the text to life in the kitchen. Rich visuals to engage readers: Numerous maps, photos, and figures illustrate and support the text and engage visual learners.